Join us as we go in search of the biggest fins in the sea! Around the Full moon, in the months of March, April, May, and June, whale sharks can be observed at Gladden Spit Marine Reserve by divers and snorkelers alike. Find out how you can be a part of this magnificent adventure and when is the best time to come see them. This species, despite its enormous size, does not pose any significant danger to humans. It is a frequently cited example when educating the public about the popular misconceptions of all sharks as “man-eaters”. In Belize, during the springtime, Whale shark frequently visit a unique area on the reef called gladden Gladden Split. This Area, about 30 miles east of Placencia, is used by over 20 species of Caribbean fish to release their eggs. However, it is the eggs of the Black or Cubera snappers that the whale sharks show up on cue to feed on. And, although you can find whale sharks all over the world, what makes Gladden Split so unique is that this is the only place where you can dive with whale sharks and encounter huge schools of spawning fish at the same time. 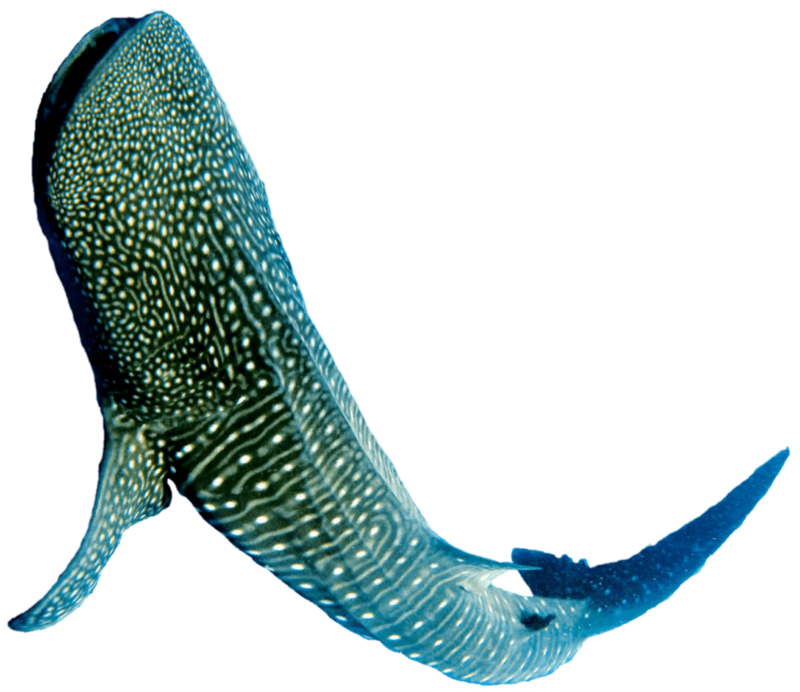 The Whale Shark expeditions in Belize was found by Brian Young Sr (Owner of Seahorse Dive Shop). In the early 1990′s, Brian began to take Guest out to the Gladden Spit, know by local fishermen as a hot spot for sighting whale sharks. Brian has many years studying the migration of these whale sharks, and although he does not dive anymore, he still Captains the boat looking for these truly majestic creatures. Even if no whale sharks are seen, the dives at Gladden Split can still be quite a unique experience. Sometimes we can find ourselves diving in a school of horse-eye or Carville jacks. We are frequently visited by Dolphins that feed on the fishes, as well as other sharks (Caribbean Reef Sharks, Bull Sharks, or Hammerhead Sharks). 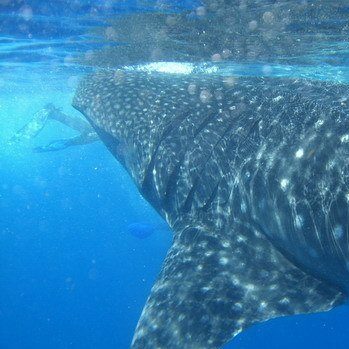 The Whale Shark Season in Belize normally begins about 2 days before the full moon up until 10 days after in the months of March, April, May, and June. However, traditionally April and May have been the best months to come and see them. If you would like to find out the best date to come and see the whale shark go here. If you are planning on coming during the Easter Holidays, it is highly recommended that you book your accommodation as early as possible because accommodation is normally hard to find during this time. The whale shark Tours normally last a full day, beginning in the morning and not returning until the late evening. Divers get 2 dives, and snorkelers get 2 snorkel sessions in the whale shark zone. Most of the time on the trip is spent having lunch, and snorkeling the patched reefs inside the barrier reef as we wait for our next session to go in the park. 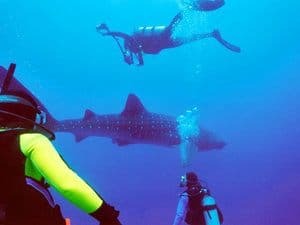 Because the Whale shark Tours are conducted in the open ocean, where most of the time there is no visible button, this tour is recommended for more experienced divers and snorkelers. Must be Open Water Certified and recommended for divers with 20 or more dives. If you have not been diving within a year we recommend doing a Refresher Course. 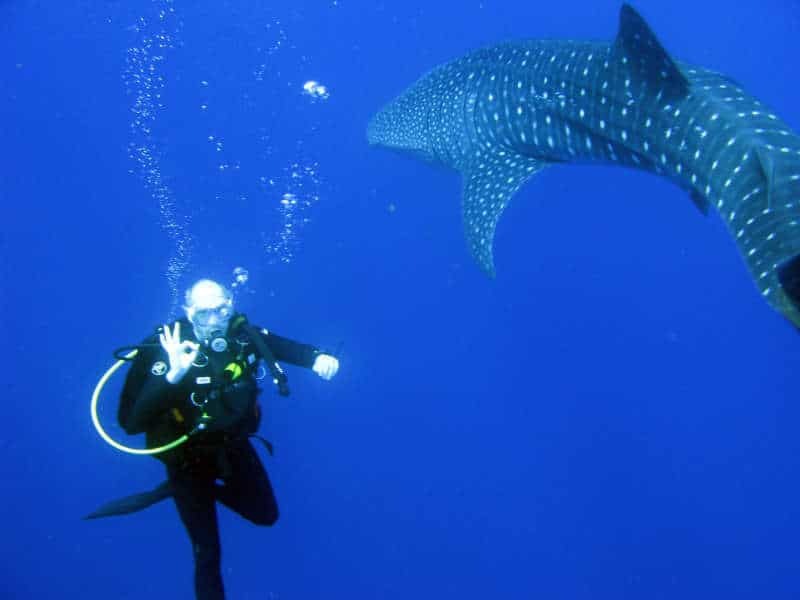 Includes 2 Dives or Snorkel Sessions in the Whale Shark Zone, Pick-up/drop-off from hotel (restrictions may apply), all diving equipment, Lunch, Whale Shark Conservation Fees,12.5% Sales taxes, and lead by a Licensed Whale Shark Guide.